KT Nets has exhibited at every Skipper Expo Int. Aberdeen because it is always a great place to do business and meet customers, according to Danny Gallagher of the Donegal based company. 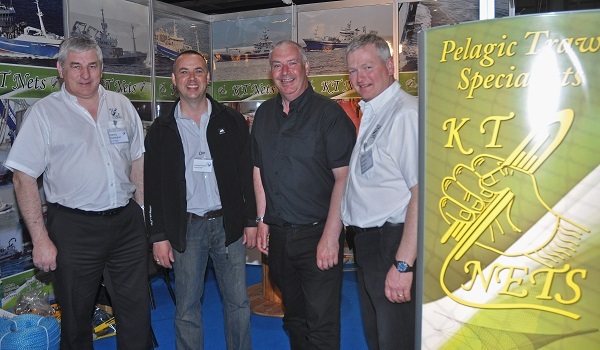 Specialists in the design, manufacture and repair of pelagic trawls, KT Nets has a strong following of pelagic skippers in Shetland and north-east Scotland, and this is why Danny is looking forward so much to Skipper Expo Int. Aberdeen 2016. Moving into considerably bigger premises just outside Killybegs two years ago has enabled the dedicated company to continue to expand and developed an enhanced service facility for existing and new clients. KT Nets has a solid reputation for providing the best quality products with guaranteed reliability, backed up with a high level of personal service. KT Nets in conjunction with Van Beelen of Holland has developed a new twine for large meshes (Combi-Twist).Made from Enkalon Nylon which gives the highest knot breaking strength of all available nylon, Combi-Twist has all the advantages of twisted and braided combined. Used first on board the M.F.V. “Antarctic” in March 2015, Skipper Gerard McHugh said he is very pleased with its performance to date.